Sara Qurashi, 11, launched ‘Justice For My Dad’ in May after her father Safi, owner of Great Britain on The World islands, was sentenced to four years in prison for bouncing two cheques. sentence for three counts of issuing bad cheques dramatically dismissed his defence team in court yesterday. Safi Qurashi appeared at the Dubai Court of Appeals on a charge of dishonouring a Dh179 million cheque to a Dubai-based trading company. 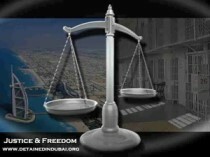 Mr.Qurashi denied the charge before Presiding Judge Adnan al Farra. He said he had presented the cheque as security to an investor he represented in a property deal at The World islands project. In a surprise move, the defendant then asked for the dismissal of his legal representation. “I would like to submit my own defence,” SQ told the court. Advocate Mariam al Falasi, from law firm Hussain Lootah & Associates, told the court her firm had not been notified of any dismissal and presented her power of attorney letter to the court. This entry was posted on August 4, 2010 at 03:48	and is filed under Dubai, Dubai court, Dubai Justice, Nakheel, Premier Real Estate Dubai, Safi Qurashi, Sheikh Manea Hasher Al Maktoum, The World Dubai. Tagged: Nakheel, Premier Real Estate Dubai, The World Islands Dubai. You can follow any responses to this entry through the RSS 2.0 feed. Both comments and pings are currently closed.